Los Angeles has a few Spanish restaurants dotted around the city these days. There’s Otoño, the new dinner place out in Highland Park that tackles the usual offerings like conservas and paella. But around a century ago, El Pueblo de Nuestra Señora la Reina de los Ángeles (Los Angeles’s original name, which in Spanish means “town of our lady the Queen of Angels of the River Porciúncula”) was littered with restaurants that seemed to evoke the European countryside. The back pages of the Los Angeles Times were, for decades, filled with advertising for spots like the old Mayan Spanish Inn or Lares in Downtown, each emblazoned with hanging signs outlining their Spanish bonafides. Fair prices and fine chefs were the call of the day, and diners flocked to the restaurants for dinnertime hours and outdoor dancing. The only thing missing in this turn-of-the-century Spanish fresco vision, still idolized in murals around the city, was the actual Spanish food. Beginning in the 1800s, Los Angeles-based Mexican restaurant owners found themselves stuck between an unforgiving, racialized dining public and a need to make a living, so collectively, they improvised, calling their Mexican-born food — from enchiladas to handmade tortillas to chiles rellenos — Spanish food instead. And in some ways, that historic whitewashing endures. The echoes of today’s politically charged immigration and street food vendor legislation issues are apparent: More often than not, large swaths of Americans still find that they absolutely love Mexican food, but struggle to embrace the people who actually make it. One of the first indoor Mexican restaurants in Los Angeles to co-opt the Spanish verbiage was the Belmont Cafe, situated at Fifth and Main streets in Downtown. In 1897 the restaurant advertised its thoroughly “Spanish” menu in the Times. It included enchiladas, carne seca con arroz, and chile rellenados, a misspelling of the classic stuffed pepper dish that traces its roots back to pre-Hispanic Mexico. The Belmont Cafe also sold tamales, a ubiquitous Mexican dish that had found its way north from Mexico and west from Texas, particularly in the decades after the Mexican-American War ended in 1848. Newspapers began reporting on Mexican tamalero men in Downtown Los Angeles as early as the 1870s, though the dish itself has been in Mexico (and Mexican-held land, as California was) for many centuries. 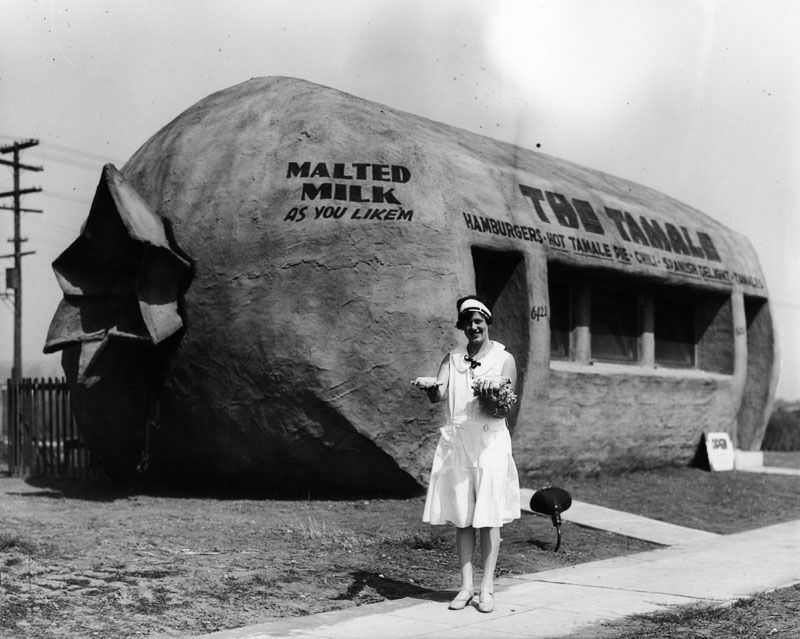 By the 1890s, a tamale explosion saw the simple foodstuff being sold from coast to coast, due largely to the emergence of the transcontinental railroad and Westward expansioneers coming into contact with historic Mexican communities. 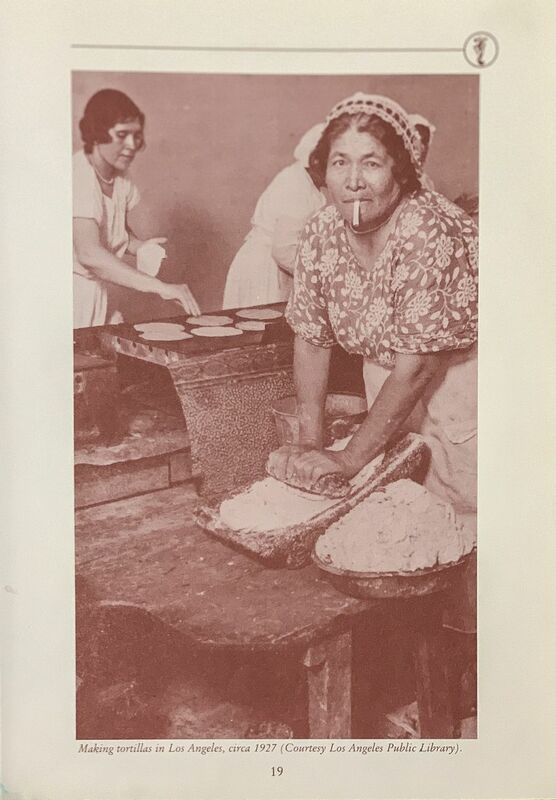 As Gustavo Arellano notes in his seminal book Taco USA, “A restaurant simply called The Tamale opened in New York’s Tenderloin slum [in 1893]; the restaurant sold tamales, chili con carne, ‘enchelladas,’ and Spanish dishes such as gazpacho.” In the 1900s a Los Angeles restaurant of the same name would jump on the rising novelty architecture trend, opening in East LA in a stucco building shaped like a tamale. Even then, the restaurant leaned on an invented history, advertising “Spanish delights” above its ordering window. Around the same time in Los Angeles, restaurants were beginning to offer similar menus, merging outright Spanish fare with the city’s own Mexican traditions as a way of bypassing local biases. An 1898 cookbook known today as Encarnación’s Kitchen documented many Mexico-originating dishes being eaten across the newly formed state of California at the time, including options like tamale pie and mole. The original title? El Cocinero Espanol, or The Spanish Cook. Whereas much of America still looked fondly on modern European society in the late 1800s, Mexican and Chinese immigrants were met with distrust, derision, segregation, and outright violence. The Spanish misnomer, then, was a workaround of sorts. The adoption of a false Spanish narrative allowed Mexicans to make a living in a city often otherwise hostile to them, and it allowed even racially hardened locals to continue to enjoy the vibrant flavors that had for generations defined greater Los Angeles. The flavors of Los Angeles, and the people behind them, have always been ingrained in the city’s heart and soul, even if white diners have been uncomfortable with the connection. And so they found a workaround, and the Euro-centric reshaping of an entire cuisine and culture was on. California historian Carey McWilliams spent years documenting the city of Los Angeles from many different angles, including its historic insistence on reframing its relationship with its own Mexican backstory, even coining a term for the whitewashing: Spanish Fantasy Past. The notion, as further explored in Natalia Molina’s important book Fit to Be Citizens and elsewhere, is a simple one. LA’s white, landowning, power-holding political center remained uncomfortable with the city’s enduring Mexican population, and sought to repave America’s road to colonization by rolling over population histories completely in order to more closely link the city to a European Spanish ancestry, which they deemed dignified. Nowhere was this retreading more widely seen than at the 1894 La Fiesta de Los Angeles, a foundational multi-day party meant to be a direct competition to the World’s Fair held in Chicago, and the newly minted Tournament of Roses in rival city Pasadena. The city’s influx of tourism, development money, and people made a moment of civic pride seem only natural, but LA’s leaders knew intrinsically that a celebration of the area’s Mexican past would never fly. So they improvised in big, colorful ways, with parades and theater performances lasting for days. The historical references anchored throughout showed Southern California as a dusty backwater run by American Indians (actually brought in by train from New Mexico) and then as a young but starting-to-thrive Spanish outlet city, complete with men in Spanish colors riding horseback and proclaiming a love for the old country. The real actors, of course, were Mexican. La Fiesta glossed over the city’s violent interracial history. 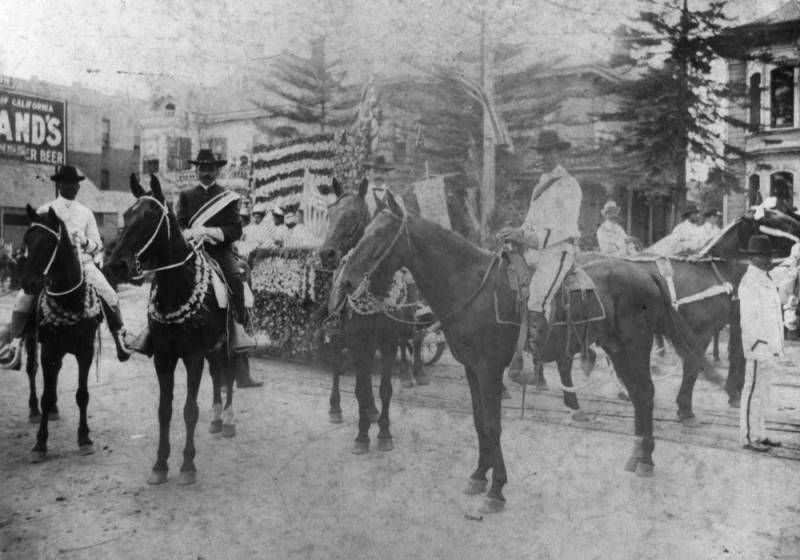 In regards to Mexicans and Mexican Americans in particular, La Fiesta offered a way to forget about the Mexican-American War and instead project the sense that the city’s white Anglo leaders had come to some sort of reconciliation with its residents of Mexican descent; for instance, the Spanish-language name of the parade, “La Fiesta,” even suggested the cohesiveness of the city and its Mexican past. The guise of celebration allowed the city’s Anglo American leaders to “whitewash” and forget the city’s unpleasant past and appropriate different cultures for economic boosterism. La Fiesta endured for decades (indeed, after a few fits and restarts, it still happens today), swelling with locals, tourists, and recent transplants, eventually coming to be regarded as an annual April precursor to Cinco de Mayo celebrations around the city, despite the overt recasting of Mexican history as Spanish lore. 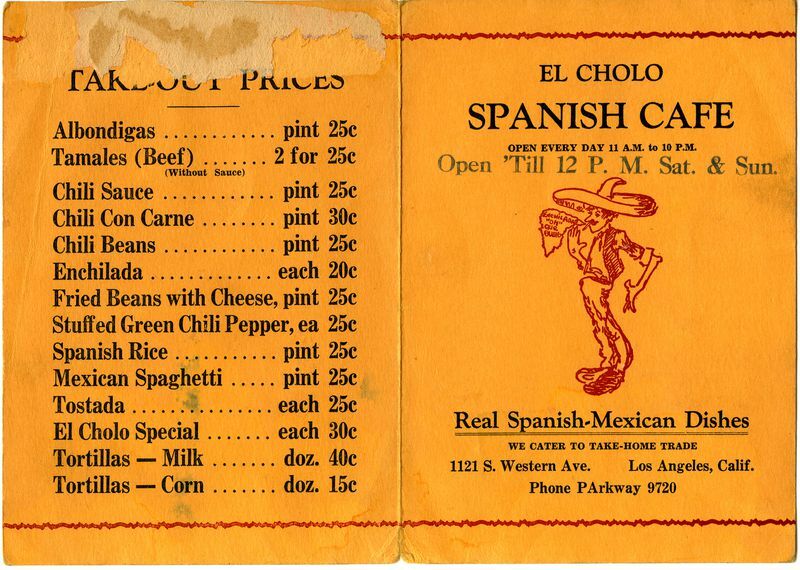 By 1927, El Cholo had changed its name and relocated to its current address along Western Avenue, complete with a hand-painted sign proudly declaring itself a home for “Spanish food exclusively.” What the restaurant actually served, from day one, were eight different Mexican entrees, including a variety of enchiladas, chile relleno, a tostada, tamales, and beans and rice. It’s worth noting here that even today, the rice served in most Mexican restaurants is referred to colloquially as “Spanish rice.” The 1997 out-of-print El Cholo cookbook says, surprisingly sincerely, of the dish: “It’s a pleasant reminder of the days when Mexican food was referred to as Spanish cooking.” Pleasant, it was not. 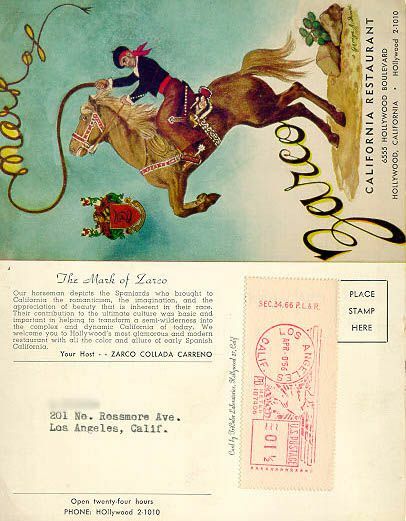 Glendale had its own celebrated restaurant called Casa Verdugo, while north of Ventura there endured for years a homey spot known as Mando’s Spanish Cafe, which advertised its spicy Spanish zalza, which of course was just Mexican salsa. 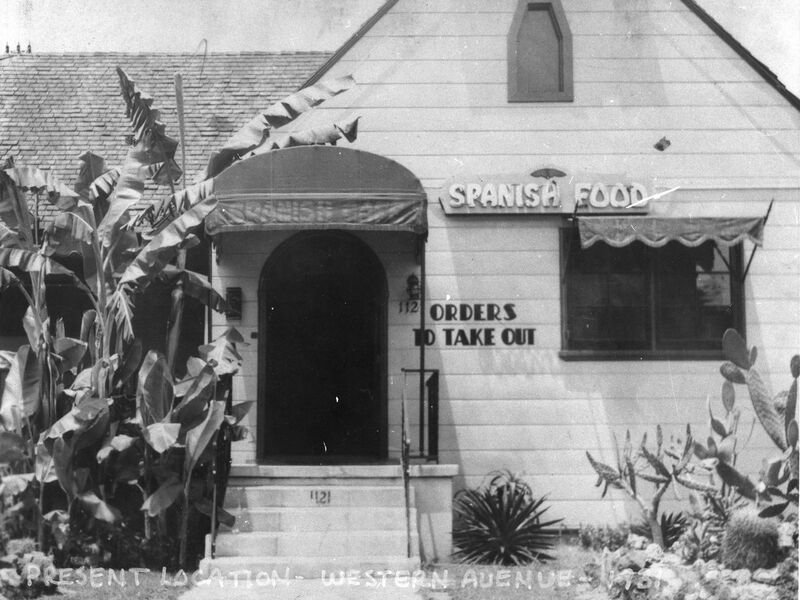 The Original Spanish Kitchen opened in 1926 with an outright Mexican menu, expanding in 1931 along Beverly Boulevard. 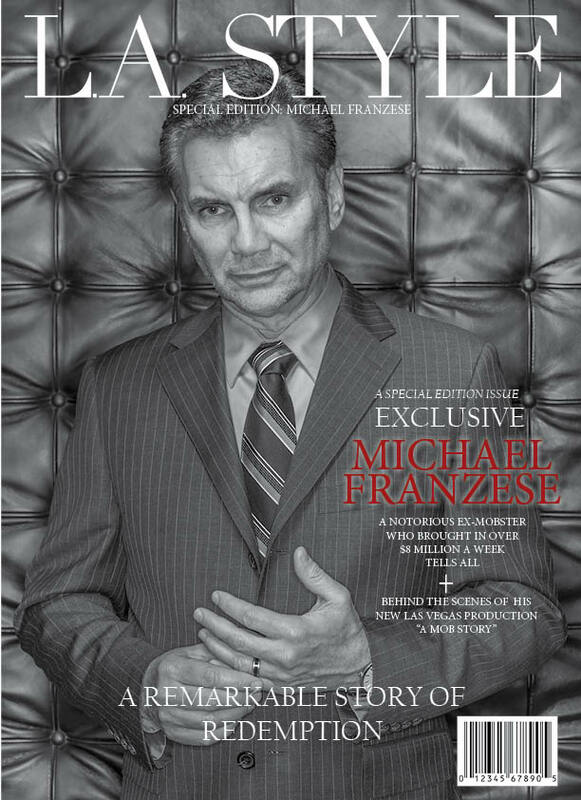 The Caretto family continued to own and run the place until 1961, when it was abruptly abandoned overnight, leading to more than a few fan theories, ghost stories, and conjectures. For years the restaurant remained framed in a time gone by, the dusty windows looking in on an empty but untouched eatery with bottles of enchilada sauce still on the tables. The original Spanish Kitchen blade sign still hangs, partially obscured, from the building at 7373 Beverly Boulevard — directly across the street from staple Mexican restaurant Petty Cash today. 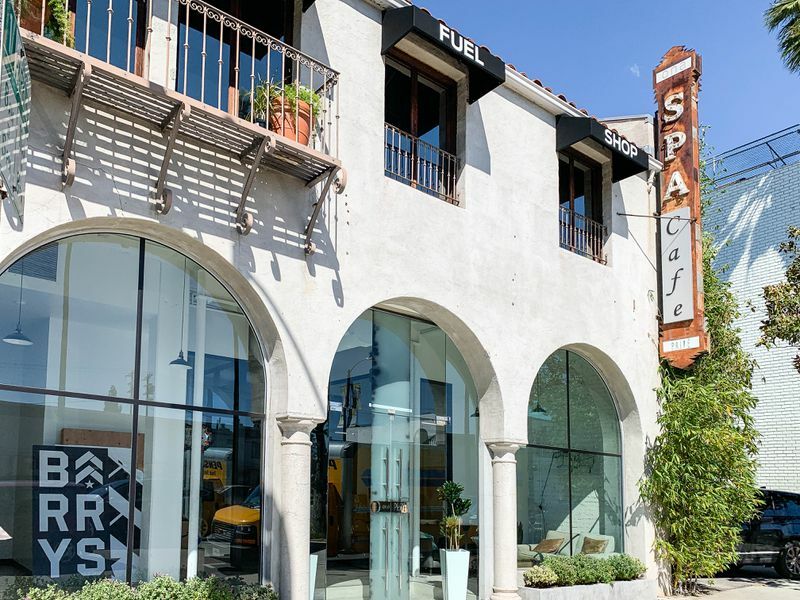 The name, meanwhile, was resurrected for a brief period by an unaffiliated restaurateur along La Cienega, though that Spanish Kitchen was able to proudly proclaim itself a home for “authentic Mexican” fare on its awning. There were, of course, some local places that bravely opted to call themselves outright Mexican restaurants from the start, including Little Pedro’s (circa 1909) in what is today Downtown LA’s Arts District. The restaurant pitched itself as a Cantina and served traditional Mexican fare (much like its so-called Spanish counterparts) and survived for many decades. The building still stands as the Moroccan Lounge, and has recently been the One Eyed Gypsy and Osso restaurant. Most others, though, found a financial lifeline only in carrying a Spanish label. By the 1950s, more and more restaurants were coming to embrace not only Los Angeles’s still-growing Mexican and Latin American population, but its own culinary obfuscation. Casa Vega opened in the San Fernando Valley in 1956 and El Cholo grew to a second location in the Orange County city of La Habra in 1962, learning to more effectively showcase its tamales and nachos along the way. Today, the dark spectre of suppressing Mexican culture and food through language and taxonomy is largely gone from Los Angeles, though pieces remain. This is a city that still occasionally demonizes Mexican street food and has a long history of calling taco trucks “roach coaches”; it’s a city that can sometimes view Mexican menus as pejoratively cheap or interchangeable. That’s only the dark part of today’s story, though. Los Angeles is also a city that has Mexican food in its DNA, and understands deeply the importance of regional Mexican cooking, from the iconic La Casita Mexicana in Bell to Sonoratown in Downtown. This city and its people can trace a culinary line from Mexico’s pre-Hispanic roots to the modern Mexican-American movement seen across Southern California, through Orange County’s Taco Maria and Ray Garcia’s Broken Spanish and the incoming restaurants of Mexico City star chef Enrique Olvera. It’s easy to say that, in some ways, Mexican food has never been more popular in Los Angeles than it is today. It’s harder still to admit that it’s always been immensely popular, even if it had to hide behind someone else’s signage for a while. Our horseman depicts the Spaniards who brought to California the romanticism, the imagination, and the appreciation of beauty that is inherent in their race. Their contribution to the ultimate culture was basic and important in helping to transform a semi-wilderness into the complex and dynamic California of today. The restaurant, of course, served tamales and enchiladas.